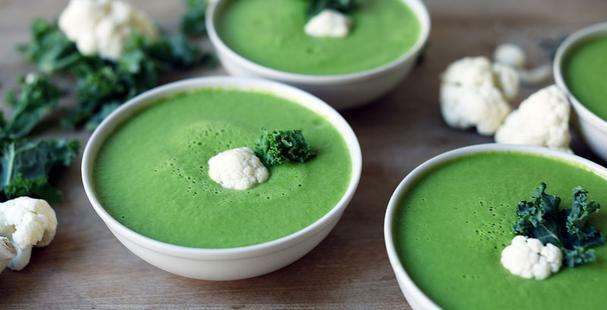 Sure, many of us will be eating green-themed foods on St. Patrick’s Day, but this kale and cauliflower soup is so delicious we’ll be eating it year-round! First roast the cauliflower in the oven along with garlic and onions to deepen and sweeten their flavors. Pop the roasted veggies in a blender with some broth, lemon juice, herbs and spices, kale, and a packet of ALOHA Greens (for a healthy punch of superfoods), and whirr yourself to a bowlful of health! Optional: 2 tablespoons plain yogurt of choice for a creamier, heartier soup. Step 1. Preheat the oven to 425°F. Step 2. Place the cauliflower, garlic, and onion on a baking sheet—drizzle with two tablespoons of oil and sprinkle the thyme and cayenne on top. Step 3. Roast until lightly browned, about 20 to 25 minutes. If the garlic begins to brown too quickly, remove it from the pan. Step 4. Toss veggies halfway through cooking. Step 5. While the cauliflower is roasting, place the broth in a blender or food processor. Add the kale, remaining oil, lemon, salt, and yogurt if desired. Blend well. Step 6. Remove the veggies from the oven—carefully add them to the kale broth and purée until smooth and consistent. Add a little water if it is too thick. Step 7. Ladle the soup into bowls and garnish with kale and cauliflower if desired.